The CBT Toolbox for Children and Adolescents gives you the resources to help the children in your life handle their daily obstacles with ease. Written by clinicians and teachers with decades of experience working with kids, these unique and effective therapy tools are vital to teaching youth how to cope with and overcome their day-to-day struggles. Amanda Crowder, LCSW, graduated from the University of North Carolina at Charlotte with her Master’s in Social Work. She is licensed in the state of North Carolina and utilizes the techniques of cognitive behavioral therapy, mindfulness and solution focused daily in her clinical practice. Tracy Elsenraat, MA, LPC, ATR-BC, is a Licensed Professional Counselor and a Registered and Board Certified Art Therapist. She has been working to bring creativity and healing into the lives of those she meets. Robert Hull, MA, ED, EDS, MHS, an award winning school psychology, career educator, special education administrator and professor, is an expert in implementing evidence based practice into practical, easy to implement strategies that lead to desired outcomes. 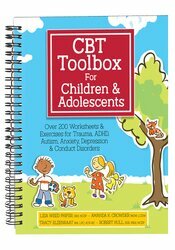 "The CBT Toolbox for Children and Adolescents has CBT activities all in one place. It offers a breadth of CBT exercises that will guide your practice with children who need support to change patterns of thinking or behavior. In addition, the authors have created a comprehensive table of contents to keep you organized and guide your selection of tools for the most common mental health disorders seen in schools and practice today. This is a must-have resource for clinicians who want effective, evidence-based tools at their fingertips." "The CBT Toolbox for Children and Adolescents is an excellent resource for any clinician working with children and families. The book covers common challenges seen in children including issues with childhood trauma, ADHD, Autism Spectrum Disorder, Conduct Disorder, Anxiety, and Depression. The structure of the book allows clinicians to easily choose activities that will target particular skill sets and participants (child only, caregiver involvement, and/or therapist involvement). The book provides a comprehensive introduction to each disorder covered and explains how the activities and worksheets will address the respective symptoms or behaviors. The activities and worksheets themselves are very easy to understand and implement, include helpful diagrams/visuals, and can be adapted to each particular child or situation. There is a wide array of activity types to appeal to children with differing strengths and interests. The authors demonstrate a clear expertise in using CBT to address these common challenges seen in children. This is an invaluable tool for clinicians to use with a range of children!"